In 2015, three armed jihadists stormed the Paris offices of the satirical magazine Charlie Hebdo during an editorial meeting and brutally murdered twelve people – ten journalists and, moments later, two police officers. The terrorists were exacting ‘revenge’ for the cartoonists’ recent depictions of the prophet Muhammad. In the days following the attack, we noted the shameful response by some Guardian cartoonists: one cartoon actually blamed the victims for publishing “racist depictions”of Muslims, whilst another blamed the West’s mistreatment of Muslims as a cause of the violence. Why, we asked, would a publication which insists it upholds secular, liberal values not fiercely defend the media’s fundamental right to offend? 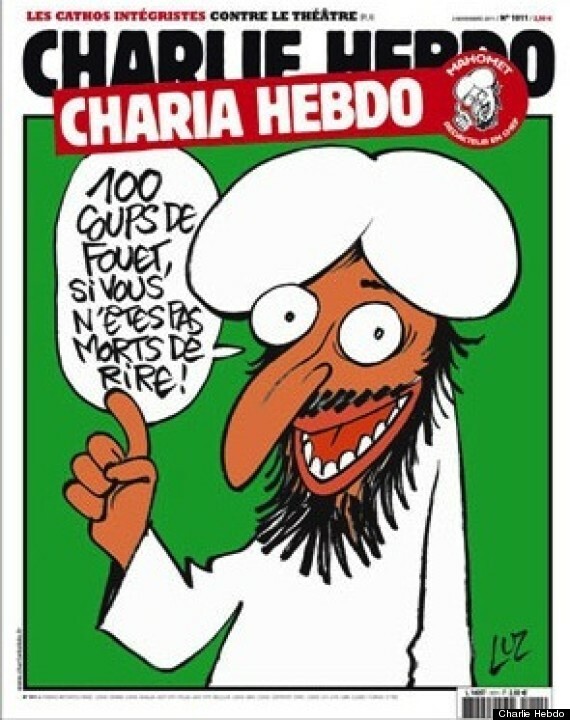 After all, the Charlie Hebdo depictions were mocking the prophet Muhammad, not Muslims qua Muslims. The cartoons were blasphemous, not racist. As noted yesterday by our sister site BBC Watch, BBC presenter Max Pearson asked Guardian cartoonist Martin Rowson about the dangers faced by political cartoonists during an interview aired on Aug. 14th. His response sheds some light on the Guardian’s reaction to the Charlie Hebdo affair. 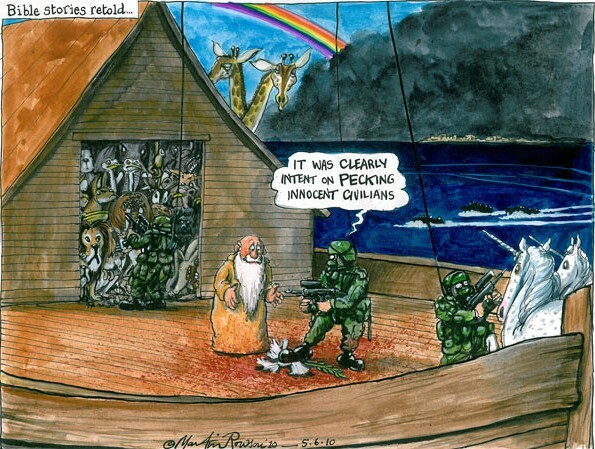 Rowson’s revelation that Guardian editors censored his proposed cartoon depiction of Muhammad, for fear that it would endanger their staff and force him to go into hiding, is quite disturbing. However, we find his subsequent comments to be unsettling in another way. Note how, after his comments on editors censoring his Muhammad cartoon for fear of violence, he immediately pivots to non-violent criticism of his Israel-related cartoons – contextualising both as dangerous examples of attacks on free expression. Indeed, this inane comparison wouldn’t come as a surprise to followers of this blog. We’ve previously revealed that, in an interview several years ago, Rowson complained that “Zionist groups” (such as UK Media Watch) have falsely accused him of antisemitism over his cartoons. He then evoked the Livingstone Formulation in alleging that the “Israel lobby is…masterful in using [antisemitism] to silence criticism of their brutally oppressive colonialism”. Of course, as much as we abhor his views, we don’t have the power (or desire) to “silence” Martin Rowson. His decision to cease Israel related cartoons was completely his own. UK Media Watch’s commentary on Rowson’s work – serious critiques which, on one occasion, included concerns that he evoked (even if unintentionally) antisemitic stereotypes – have been civil, and in a manner consistent with the rights of free speech and criticism afforded in any democracy. Left: Martin Rowson’s depiction of Henry Kissinger. 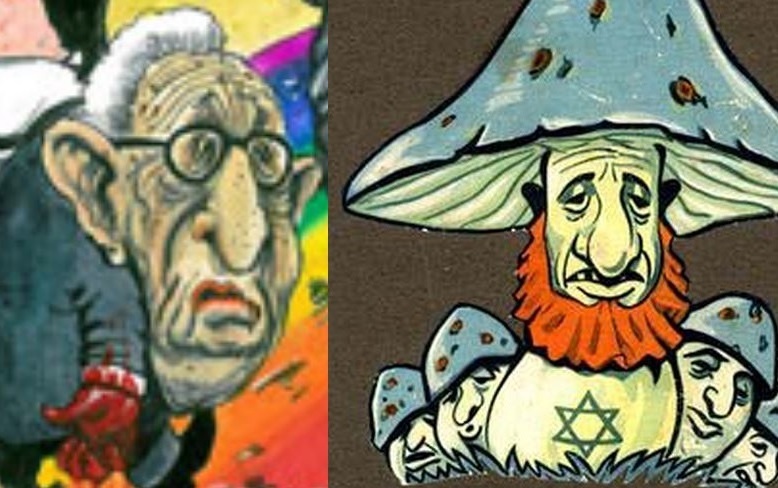 Right: Infamous antisemitic caricature in a Nazi book titled ‘The Poisonous Mushroom’. Finally, Rowson’s risible evocation of such Zionist criticism in the same breath as jihadist threats to cartoonists after Charlie Hebdo seems an apt metaphor for the Guardian’s coverage of the region: reports and commentary which often include an implicit moral equivalence between the region’s sole liberal democracy and its regressive (and decidedly violent) tyrannical foes. And yet Martin Rowson will cry about being silenced when I make the association between him and Nazis. Well, Marty, if it quacks like a Nazi duck, then it must be a Nazi duck. The sun never sets on the British Empire, and you’re condemning Jews living independently on their own indigenous soil of colonialism? Someone must have dropped you on your head when you were a baby.